"Tonight ladies and gentlemen we have a very special presentation for you coming all the way from India. Some know I am very interested in the Seven Years' War and...."
"Hmm. --- And Colonials too." "Hey --- cut out the jokes --- and don't interrupt the show! So we thought, why not combine the two in the 18th Century? --- That's just what we'll be doing on my belated Annual Birthday Game Day on May 6, 2017. --- Three new units will appear." 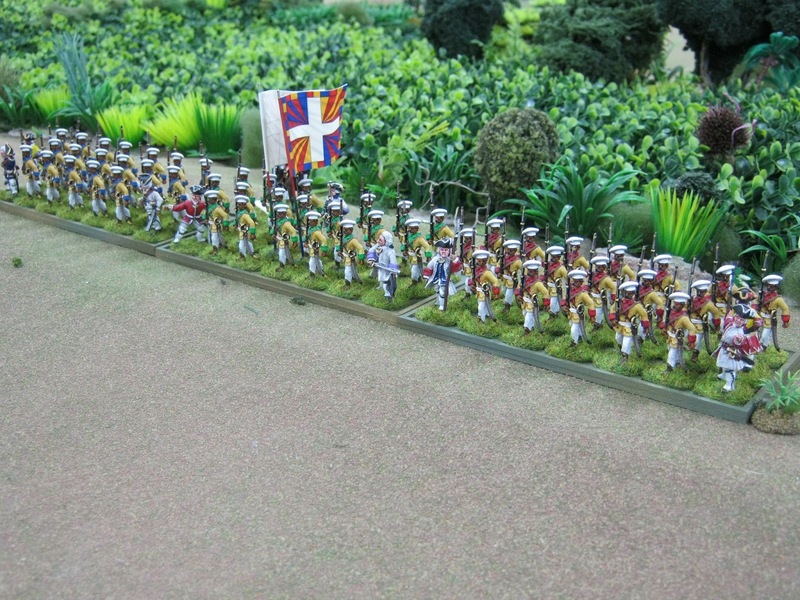 French Sepoy Battalion from the Nellore District 1750-1755 adapted from René Chartrand's description. 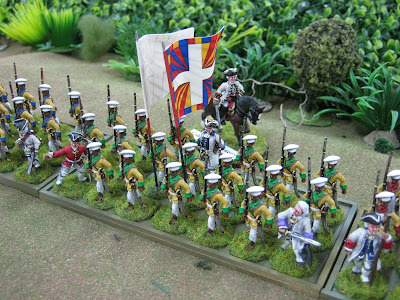 See Osprey's MEN-AT-ARMS SERIES #313 LOUIS XV'S ARMY (5) COLONIAL AND NAVAL TROOPS, pages 19 and 47 plus Color Plate G.
Three companies above in yellow coats faced in red, green and blue. 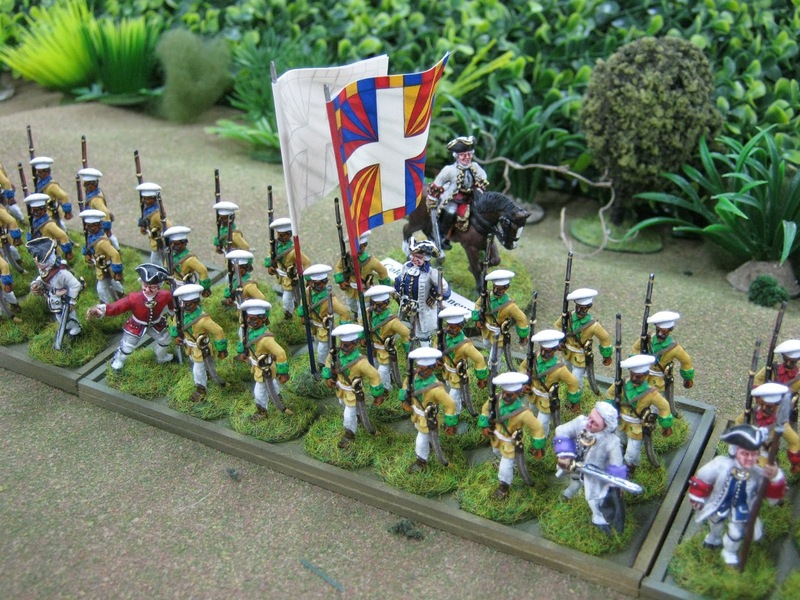 Three companies in red coats faced in yellow, green and blue. Three companies in green coats faced in red, yellow and blue. Three companies in blue coats faced in red, green and yellow. My drummer uniforms are totally fictional. All are 28mm. 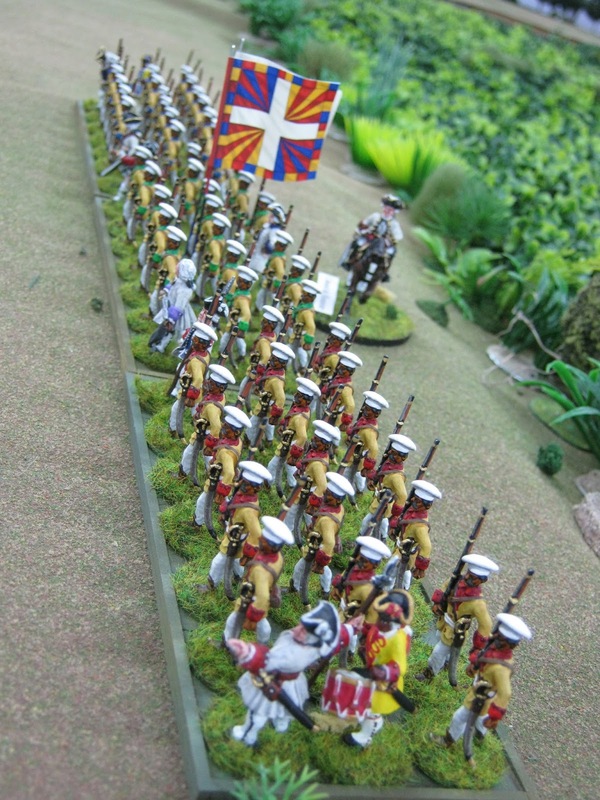 Line soldiers are from Indus Miniatures, drummers are Crusader and most officers are Front Rank from their Seven Years' War European and North American French and Indian War lines. I luckily had a colorful GMB flag from Regiment Aquitaine on hand and decided to use it --- just because.... it is colorfully busy. French officers wore their own regimentals from France. 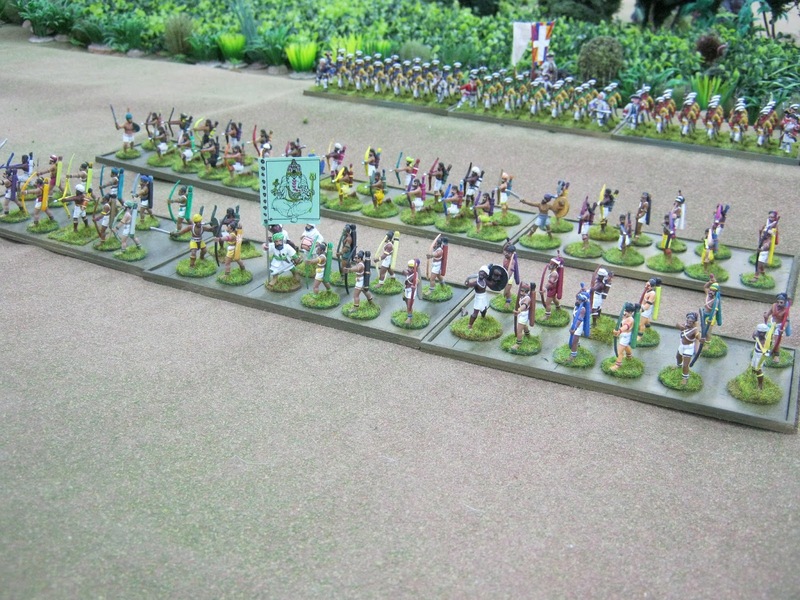 All but the drummers were expertly painted by John Preece. "Whaaaat? Who let you in here anyway?" "They're wearing chef's hats aren't they? We'll have curry chicken, samosa and chai tea." "The very idea. --- Chef's hats! 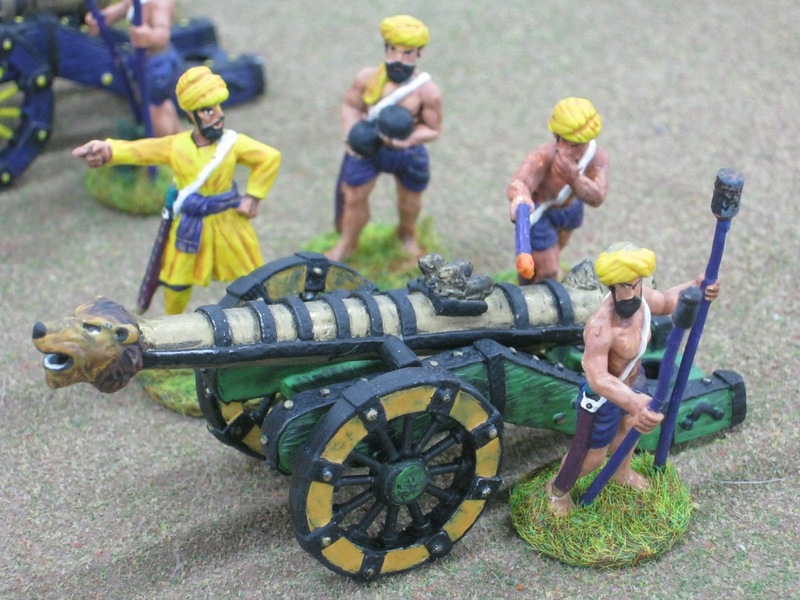 Here's some shocking 28mm firepower from Indus Miniatures. Do you think I painted the lion's head realistically? This model is terrific. 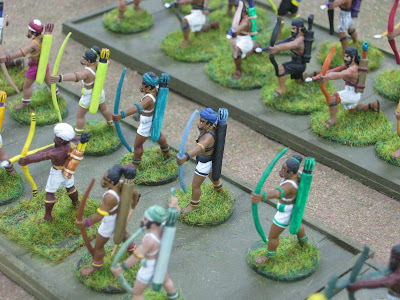 Indus Miniatures Hindu Archers. Every bowman has his own color scheme; all 72 of 'em! They were a lot of fun to paint. Fast too. 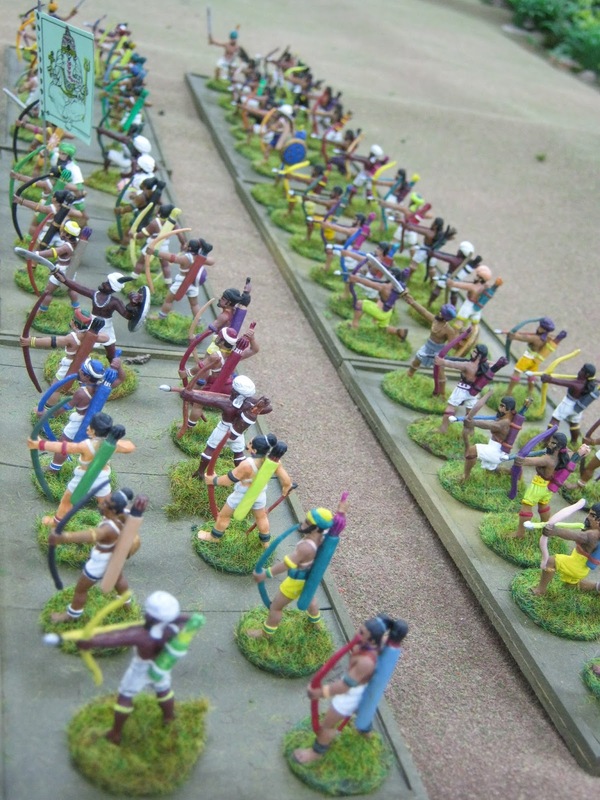 I have no idea if native forces formed units of bowmen. I simply reasoned, if the Romans, Carthaginians and Medieval armies had bow units, why can't there be some in India? My talented friend Juergen contends they should be broken apart and spread out in other units of mixed weapons. Gee, that makes sense to me. 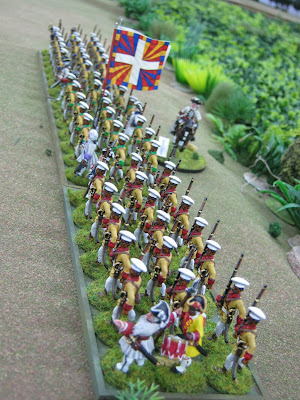 Maybe I am too taken with skirmisher screens of one kind or another. 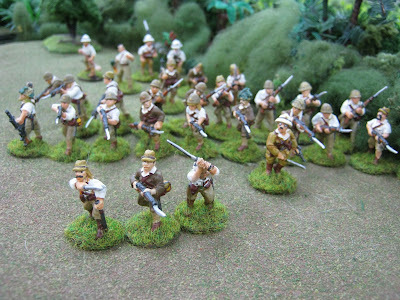 Depending on the two forces in the game, I told Jim P. (Der Alte Fritz) I could break this unit in half letting the British use one. There is little time left before the game to add more units. 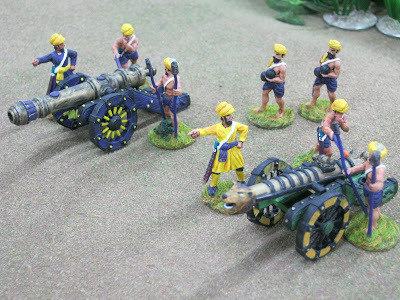 However, these thirty-five or a bunch of them are supposed to reinforce two units needing more numbers. Wish me luck won't you? "Oh. It's you guys again. Well?" "You'll never get those natives finished in time!" "That's what you think, do you?" "Never in a million years!" "Hmm. --- Well, I 'll show you! Goodnight everybody. We'll be back in three weeks with our next show." 1) And I have to terra-form the table, figure orders of battle and design the scenario. 2) Do you think I can finish in time? 3) Your remarks are welcome below at Comments. The post dated March 9th, 2017 showed what I planned to paint in my Personal Painting Challenge. A few pards joined in too. That made it more fun. Here is what I finished nine hours before the 11:59pm deadline on April 15th. Reason: To jump-start our S. Pacific WWII Campaign. You know, to add more stuff. 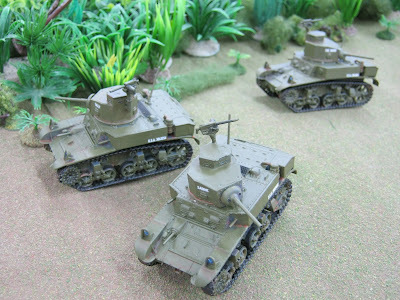 Two Japanese Type 95 HA GO Light Tanks. They are armed with a 37mm main gun and two machine guns. 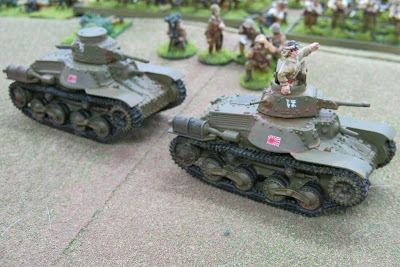 The turret MG broke off on the leading tank. Yours will too. It is a very easy fix. It was replaced by a small length of wire cut from a paper clip. The leading AFV turret decal shows it is an HQ tank. The second tank's decal looks a little like the number 5. It is not. It means it is from the 1st Company. 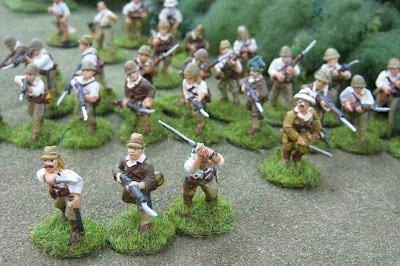 Models are resin with some metal from the Bolt Action range offered by Warlord Games; really nice models. Clunky tanks are my favorite AFVs, especially if fast. 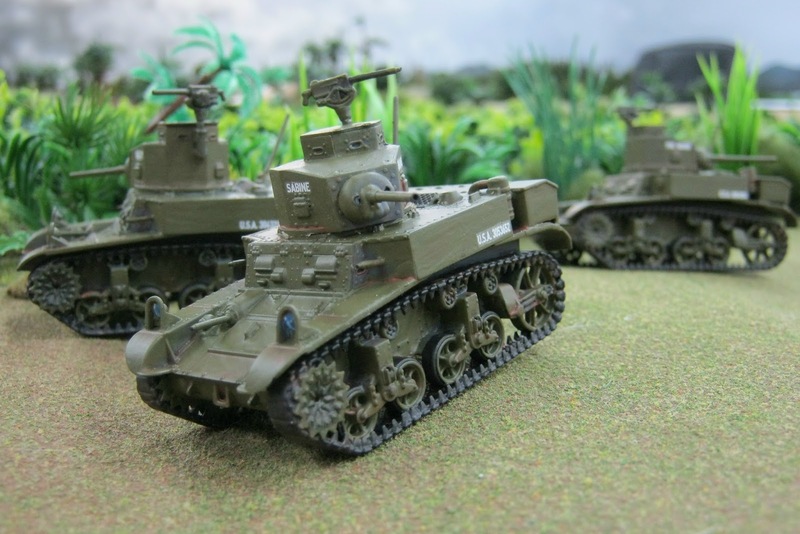 These USA M3 tanks are certainly clunky and fast. The paint and decal scheme are for operations in late December 1941 and early 1942 on Luzon in the Philippines. 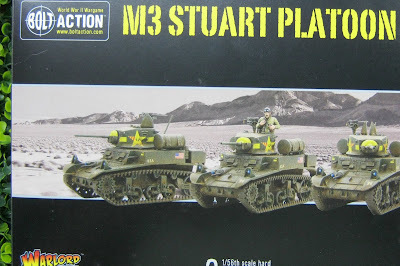 My M3s came from Warlord's Bolt Action three tank boxed set. There are enough parts for Soviet, Western Desert and Tunisia variations. I jury-rigged mine as best I could for the US Army on Luzon in 1941-42. You could probably alter them for the USMC early in the war. These are superior models. The engineering put into these plastic models is proof. They will be looking for the HA GOs in the first photo soon. These are newly painted 28mm Japanese Army infantry from Brigade Games and The Assault Group. These fellows are almost all fairly active in keeping with Army doctrine to move fast and never mind waiting to build up your force before attacking. Apparently this worked versus less well-trained and poorly equipped opponents such as the Philippine Army in 1941 but not the USMC in 1942. 1) This personal challenge worked well for several people as an incentive to cross the finish line before time ran out. Deadlines work. Anything was eligible; partially finished or totally unfinished items, easy or more involved to do. The idea was to get a bunch of stuff done. 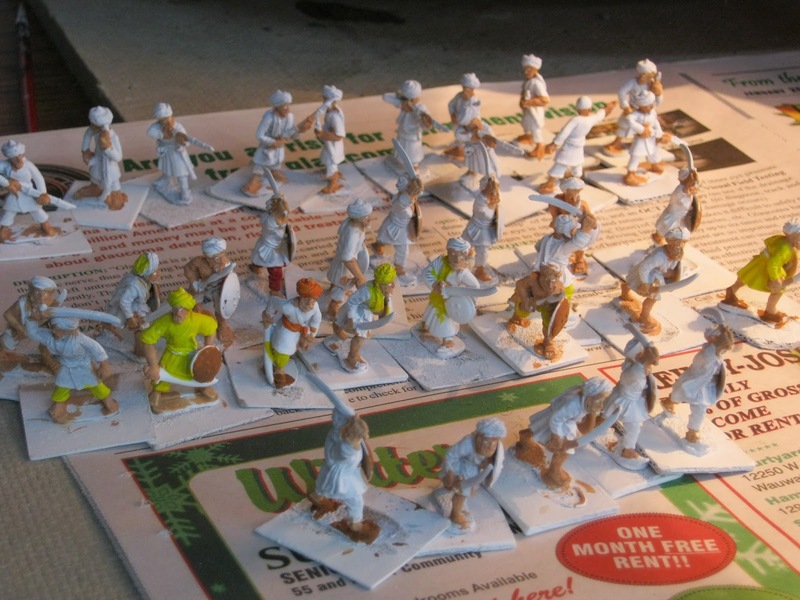 2) John joined in painting more than sixty items from various time periods. Ditto for Michael M.
3) John emailed me saying he wants to start another Painting Challenge. Okay John! You are on. Let's see, sixty French Sepoys need basing and underlying movement trays. That counts for something, eh guys? Well! This needs to get done for a SYW game in India soon. 4) How did you do? Your remarks are welcome at Comments below.